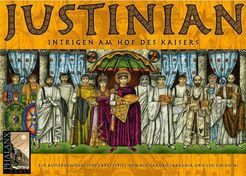 Popis hry: In Justinian the players try to win the favor of Emperor Justinian. To further their aims and to strengthen their position at court, they bribe influential persons at Justinian´s court. These bribes are represented by four different colors in the game: At the end of each game turn one color is scored. The players get victory points if their court followers have increased their clout at court. However, only three of the four colors in Justinianare scored!